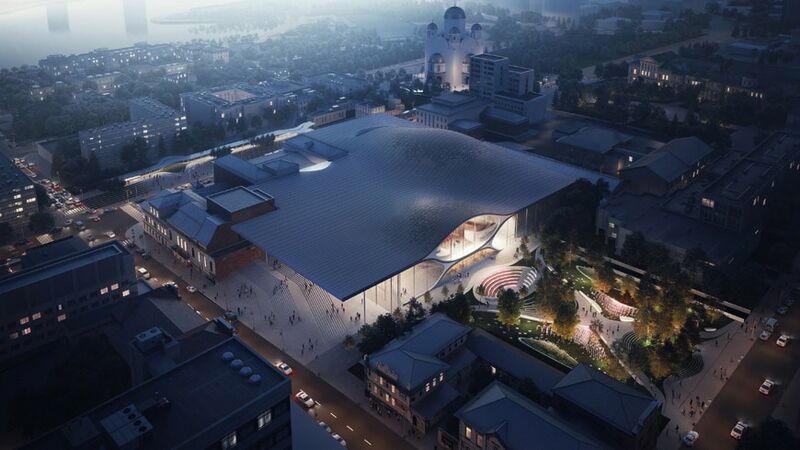 Zaha Hadid Architects have been selected by the jury of the international design competition to build the new Sverdlovsk Philharmonic Concert Hall in Yekaterinburg, Russia. Yekaterinburg has built a rich musical tradition and established its reputation as a cultural and artistic center and the city’s orchestra cultivates aspiring young talent and has as its foundation a dedicated, passionate and growing society of music lovers in Yekaterinburg and around the world. 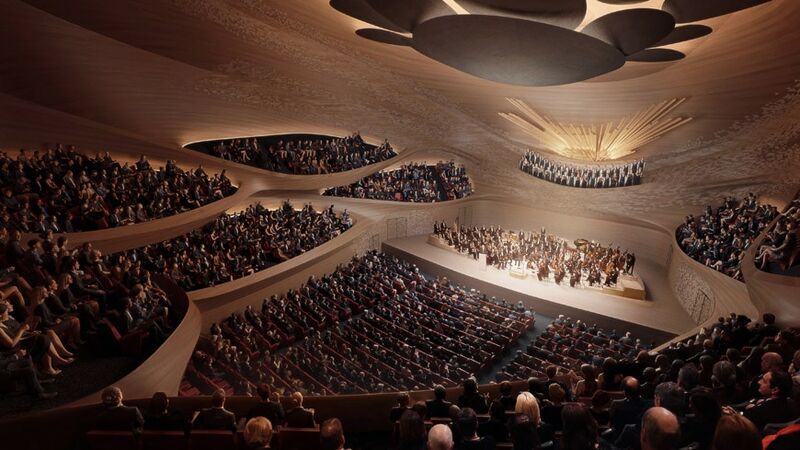 Echoing the physical aspects of sound waves, the design of the new Philharmonic Concert Hall is based on the properties of musical sound resonance creating wave vibrations in a continuous smooth surface. 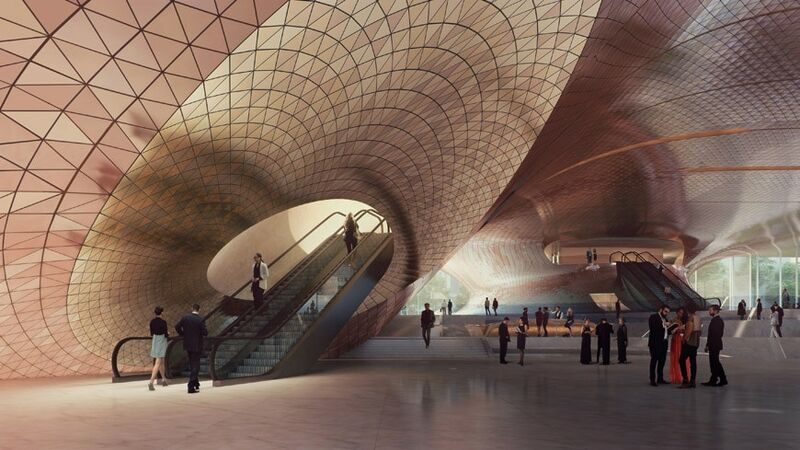 The design re-interprets these physical acoustic properties to define spaces for the auditoria that are suspended within the canopy, appearing to float above the new civic plaza that is both the lobby of the Philharmonic Concert Hall and an enclosed urban square. 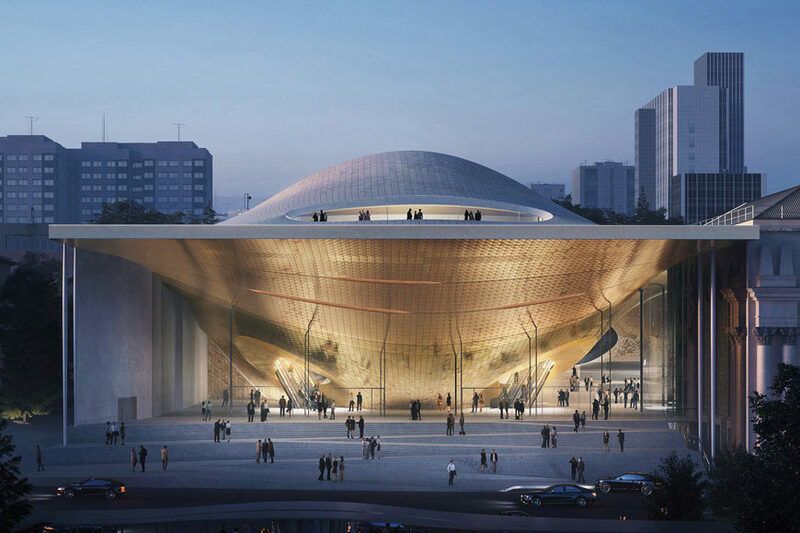 Providing a 1,600-seat Concert Hall and a 400-seat Chamber Music Hall of the highest acoustic standards, these new auditoria are nestled within the surface deformations of the suspended canopy; liberating the lobbies from obstructions to open this space as a vibrant new gathering place for the local community. This new 21st century addition will inhabit the void between the existing buildings and Weiner Gardens; not competing with these heritage buildings, but complementing the ensemble that will include the preservation and renovation of the current concert hall as an integral element of the new world-class facility that will be one of the focal points of the city’s cultural life. 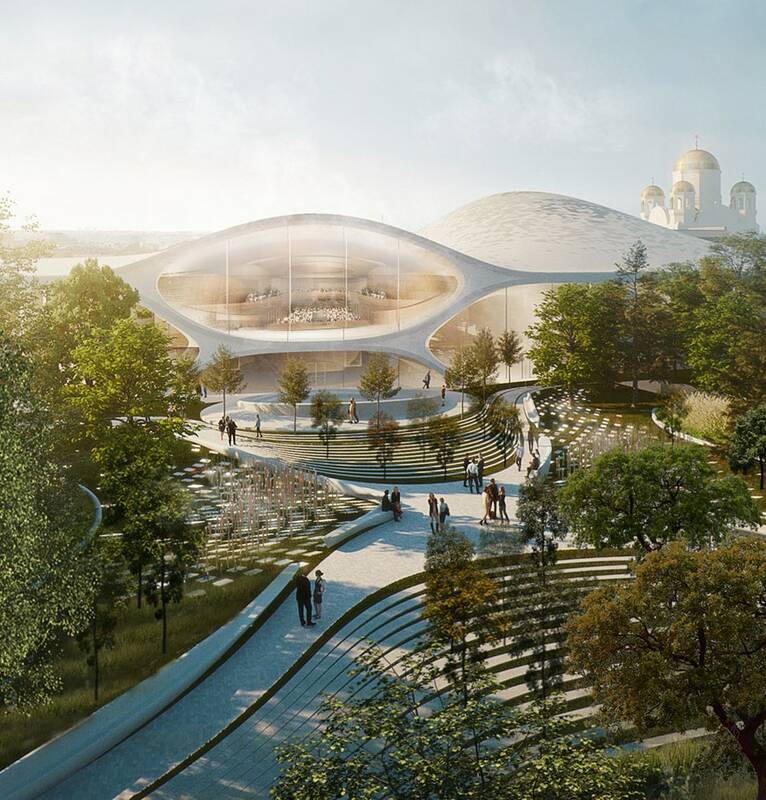 Similarly, the new building does not impose upon the adjacent Weiner Gardens but seamlessly merges with the natural landscape; opening its transparent glass facade to offer views of the renovated gardens that includes an amphitheater for outdoor performances throughout the summer. The lobby serves not only as an introduction to the world of symphony music but also as a welcoming public plaza for all members of its local community. The existing Sverdlovsk Philharmonic Hall is housed within the city’s old Civic Assembly Building that was originally built as a club for all citizens to gather. 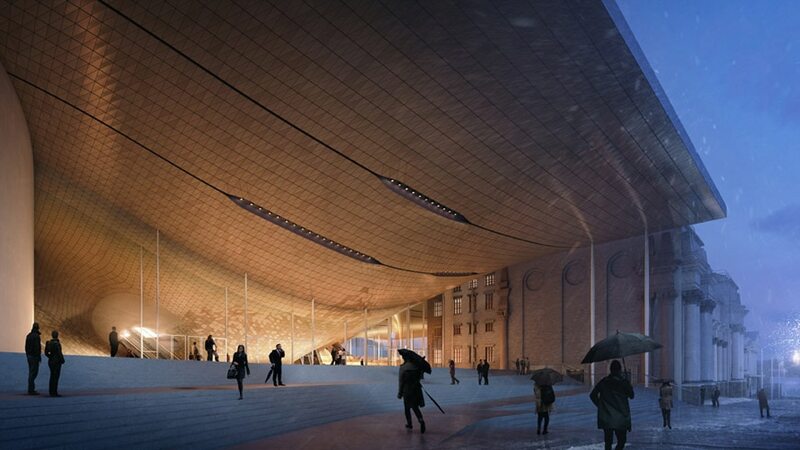 The new design revives and enhances this commendable civic legacy; its spaces designed to function as a center of Yekaterinburg’s civic, social and cultural life. Enhancing its connections with the surrounding urban fabric of the city, large glazed facades blur the boundary between interior and exterior; inviting visitors to experience the spaces within that celebrate public gathering, civic forum, and creative endeavor. The Philharmonic Concert Hall’s procession of interconnected public spaces continues through the building to its rooftop terrace overlooking the city’s Church of All Saints.